Windows XP end of support is real this time! According to Microsoft as shown here, Microsoft will officially end the support for Windows XP on April 8 2014, so that means those new bugs or security holes identified on Windows XP operating system will not be patched by Microsoft after that date. Please note the support on Internet Explorer 8 and Microsoft Office 2003 is ended together with Windows XP too. 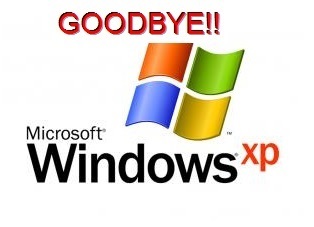 You are highly recommended to cease using Windows XP from now on and use other newer operating system, such as to upgrade your computer to Windows 10 or newer OS, because very likely your Windows XP will be hacked easily in future due to security vulnerabilities. Update Windows XP with latest patches developed before end of support date, this will make sure your XP machine is updated with all existing patches. From my understanding, you can still use Windows Update to download all existing XP security patches after end of support date as those XP patches will still be available. Check all the installed software on Windows XP and uninstall those you don’t need to use anymore. For the software you still need to use, make sure you continue to update them with latest patch too. Don’t use Internet Explorer web browser on Windows XP anymore as it’s no longer supported by Microsoft after end of support date, use other web browsers instead, such as Google Chrome, Firefox or Opera web browser. Use limited user account that got limited system access when you use Windows XP daily, so that to minimize the damage when your XP computer is attacked by hacker. You should have antivirus and anti-spyware software with up-to-date signature installed to secure your XP computer. Don't forget to enable real-time protection feature in your antivirus or anti-spyware software too. Disconnect that XP computer from Internet when you don’t need it or don't connect it to Internet at all, so that to minimize the chances from hacking. You could easily do it by disabling the wireless or network adapter in Windows XP machine. That’s it, hope you like it! Return to top of "Windows XP End of Support"! !